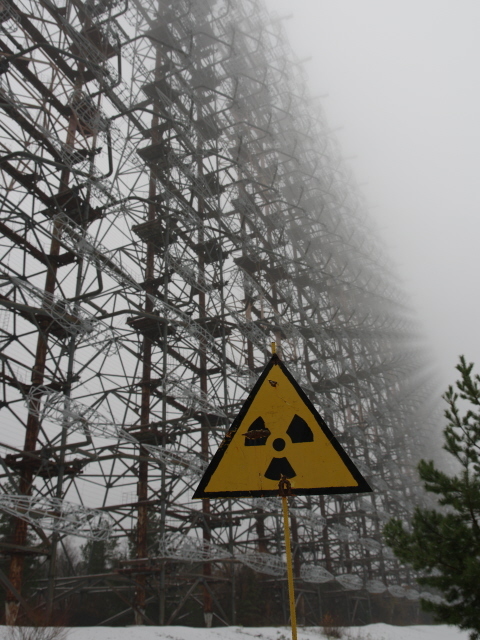 A gigantic Cold-War-era early-warning radio installation located right in the middle of the Chernobyl Exclusion Zone. The structure is so bizarre they couldn't have made it up better for a James Bond film or a Sci-Fi flick. 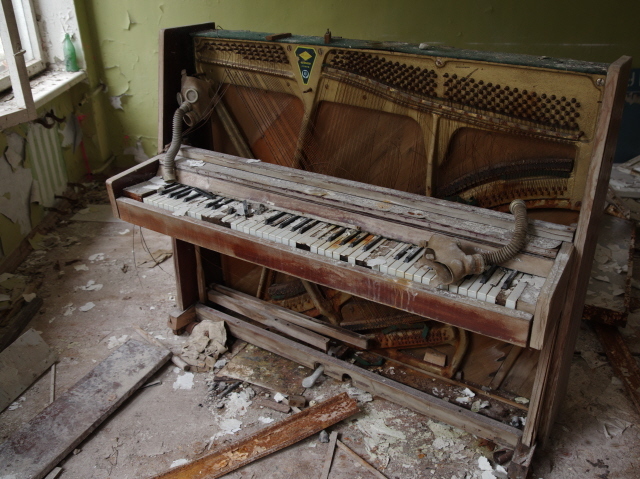 But it is genuine … and derelict. A fantastic add-on to tours of the Zone, especially for those into urban exploration and crazily oversized Soviet Cold War relics! More background info: This monster of vintage technology was a so-called over-the-horizon (OTH) radar installation that formed part of the Soviet Union's Cold-War-era early-warning network supposed to detect launches of ICBMs from the USA. It was developed because anti-ballistic-missile systems relying on regular line-of-sight detection could only have reacted too late. This was at a time before satellite systems could take over this task more neatly and accurately, of course. The OTH technology utilizes the refraction effect of the ionosphere, the part of the Earth's atmosphere and magnetosphere ca. 40 miles (60 km) above ground. That way these radar systems could reach (depending on their size and power) hundreds or even thousands of miles beyond the simple line-of-sight limit normally imposed through the Earth's curvature. Don't ask me for the exact technical details of how such a system really worked (ask a radio physicist instead), but one thing is clear: it required a hell of a lot of electric energy. Hence building it near the newly constructed Chernobyl NPP made sense. There are in fact two OTH arrays adjacent to each other at this site, and there used to be another site associated with these located north of Chernobyl (namely the transmitter ... but whatever may remain of that is apparently inaccessible to the public; so I was told by my guide who once tried to get there but was refused access). 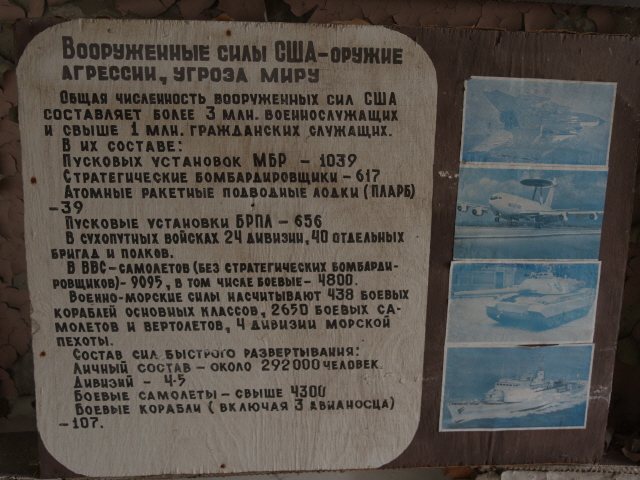 There were at least three such systems in the USSR, and there is some confusion about their correct designation. 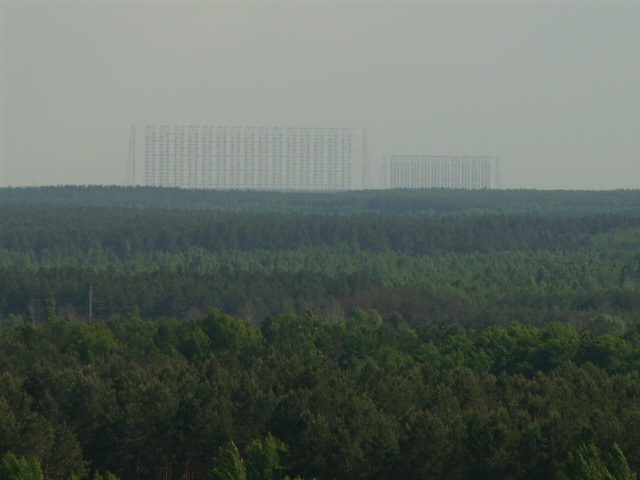 The installation near Chernobyl is frequently referred to as Duga-3 (e.g. also on Wikipedia). The first Duga was a prototype of such an OTH radar and a second system was tested elsewhere. 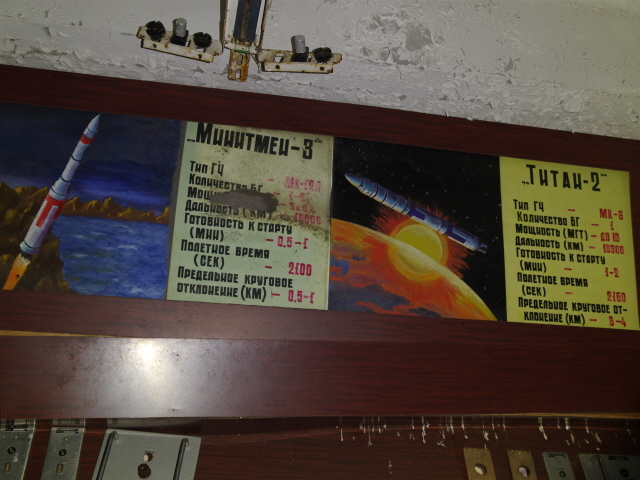 But at least one Chernobyl tour operator vehemently disputes this, saying the first system didn't have a number, so that the count only got to Duga-2, meaning a “Duga-3” never existed, and that the one at Chernobyl is actually Duga-1. Going by Wikipedia, however, both the far-eastern system and the one at Chernobyl were named Duga-3 (one “east” one “west”). I am in no position to settle this dispute – and ultimately it doesn't matter for our purposes. Let's just simply call it Duga here. 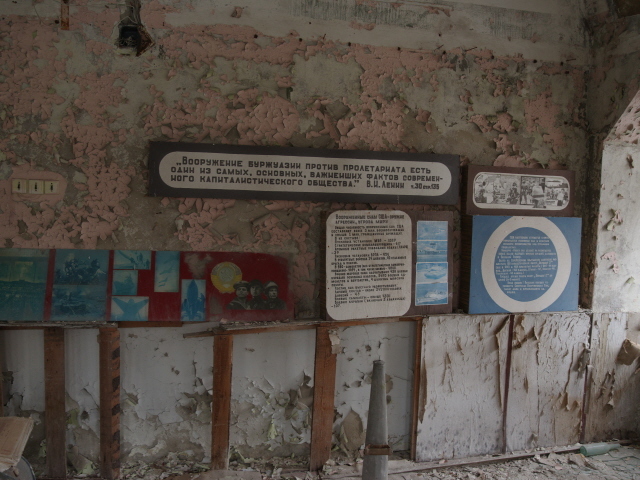 Within the Chernobyl Exclusion Zone there can't be any confusion of numbers anyway. There is only this one installation of such a type here. 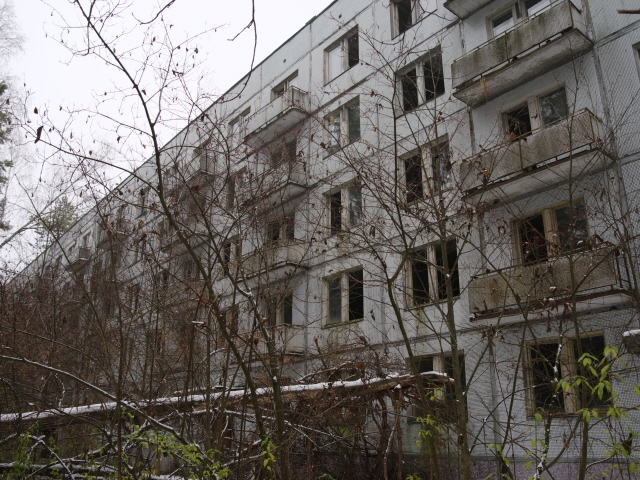 However, the location is also referred to as Chernobyl-2. This was the name given to the garrison town associated with the operation of the Duga installation. This follows a classic Soviet approach of giving secret “closed” military places names borrowed from more or less nearby other towns/cities plus a number (cf. Perm-36). Being so top secret Chernobyl-2 and Duga were not found on any maps during the Soviet era. The West however soon realized there was something of this sort going on. 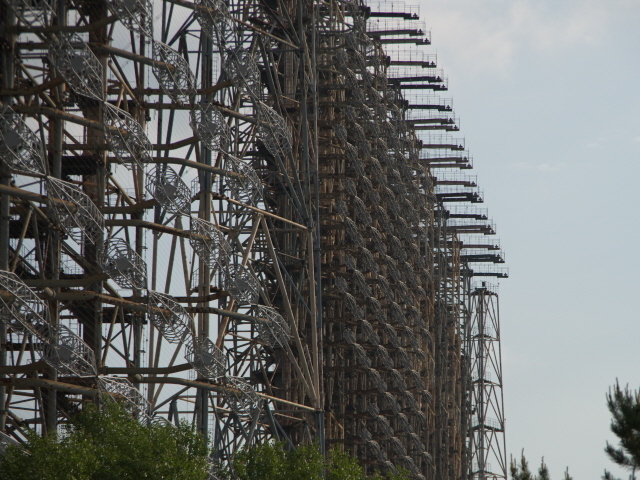 Apparently NATO intelligence had been aware of the installation near Chernobyl from early on and gave it the code name “Steel Yard” (not inappropriate, given the look and nature of these arrays – see below). And to add even further to the Babylonian plethora of names for this one object, it was also called “the Russian Woodpecker”, in particular by amateur radio operators, because of the interference noise it created in certain parts of the short-wave band. (The Wikipedia entry for Duga-3 also has a sound file you can play – I found it sounded more like a pneumatic drill some distance away.) In addition there were various typically crazy conspiracy theories associated with this interference (ranging from weather manipulation experiments to alleged attempts by the Soviets to achieve mind control over the American public). 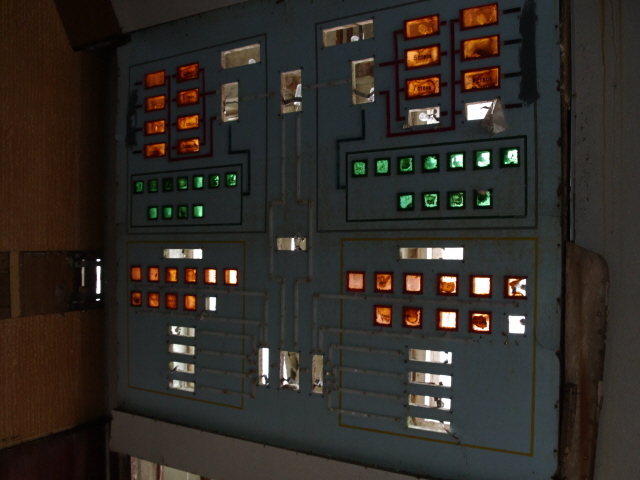 The system is said to have been built in the 1970s and first started operation some time between 1976 and 1979 (again, sources vary on this). At some point during the 1980s the frequency was apparently shifted, presumably because of that interference (while the existence of the installation was still not officially admitted). And from 1989 it suddenly stopped altogether, for unknown reasons. Maybe it was simply regarded as redundant … the Cold War was nearing its end, the USA and USSR had reached nuclear arms limitation agreements and by then satellites had taken over the early-warning role anyway. What is certainly not the case is that Duga stopped operating because of the disaster at the Chernobyl NPP in 1986. The other three reactors continued operating into the 1990s (the last one was shut down in the year 2000). 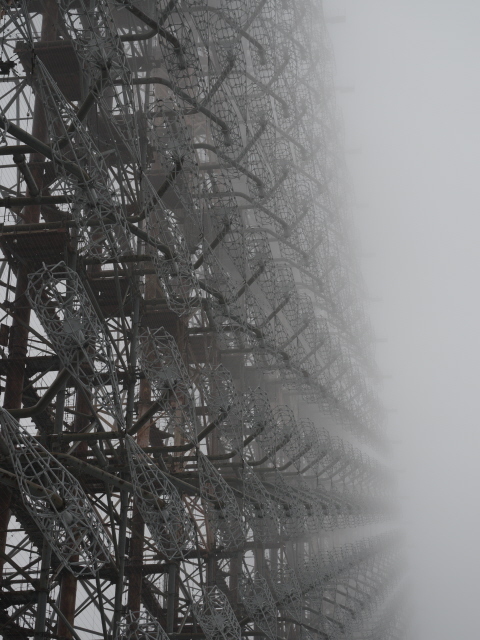 Today this Duga system within the Chernobyl Exclusion Zone is the only surviving OTH radar installation of its type left in the territory of the former Soviet Union. Its counterparts and predecessors have meanwhile been dismantled and scrapped. 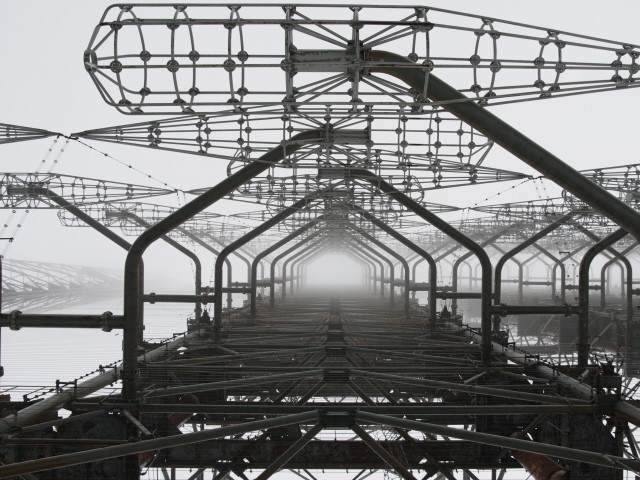 Luckily, the Duga arrays at Chernobyl were spared that fate so that we can still marvel at them today. 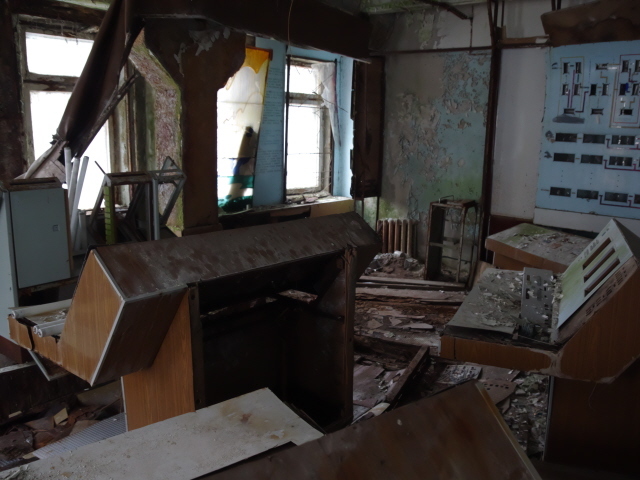 And given the fact that this is now quite regularly part of Chernobyl tours, it is to be hoped that this will remain so for some time to come. What there is to see: This site is amazing, jaw-droppingly awesome and ultra-cool. The most James-Bond-villain-against-the-world-like site I've ever seen. 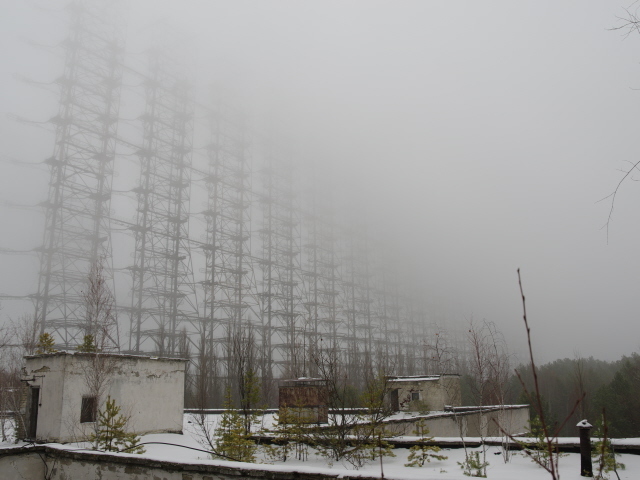 You can see the huge antenna arrays from a distance – in theory even from the NPP and Pripyat (if you can get to a high enough vantage point, such as a rooftop, which officially is no longer allowed in Pripyat, though). From on the ground, the forest makes them mostly invisible, but once you get close on the approach road you begin to get a vague feeling of the size of the installation. But that still does not prepare you for the awesome effect when you finally get to the bottom of the array, walk in front of it and look up. This is a site where size matters – a lot. These strange things are absolutely huge. The larger of the two arrays is ca. 150m (500 feet) high and 500m (1650 ft) long. The smaller of the two arrays stands directly adjacent to its taller brother, but at ca. 110m height (360 ft) and 250m width (800 ft) it is also still pretty impressively humongous. And it's not just the size that amazes here. The whole technological structure and all the associated details, are just so mysterious … unless you are a radio technology expert, I suppose – but then you'd probably be even more impressed by the sheer dimensions of this installation. Plonked in the middle of nowhere, the arrays look almost like something you could believe must have been put here by extraterrestrials, so Science-Fiction-like is the whole impression. Better than anything in even the most outrageous James Bond movie, is another common reaction when trying to describe it. Ultimately, though, it's a case where images say more than a thousand words – so you may want to go straight to the photo gallery below to get an impression for yourself! There used to be lifts for service personnel to reach the top of the arrays, but obviously these have long since stopped working. You can peek into some of the bottom stations under the lifts and you quickly see it's all rusty, fuses are gone, all beyond repair. 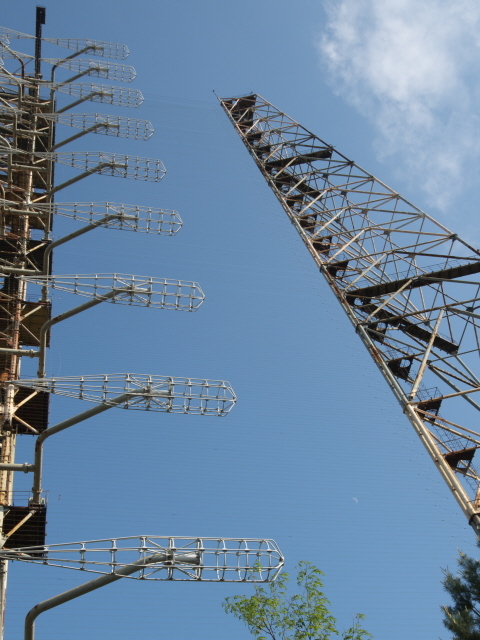 But there are still ladders going all the way up too … and clearly these have been used on many occasions, not least by some urban explorers who then posted videos of it on YouTube (simply search for Duga, you'll instantly get several). My guide said it took him 25 minutes to get to the top, and you can imagine it's a tough workout. Now he's a fit young man; somebody less fit (or young – such as myself) would probably take a lot longer to do it. I must say I was tempted, but a) sense prevailed, and b) we wouldn't have had the time either anyway. 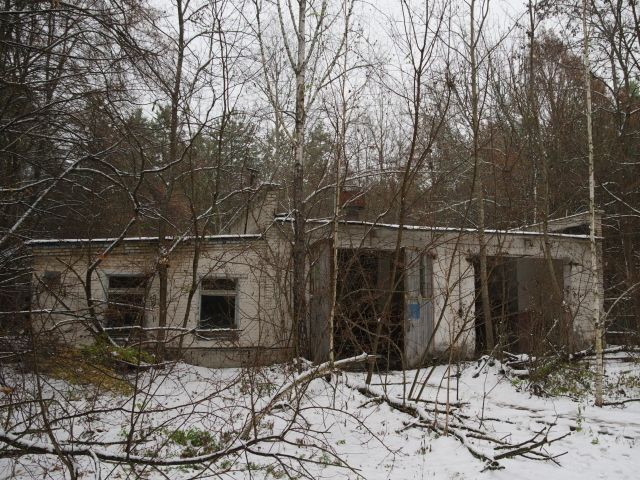 It was the last stop that day and we had to get back to Chernobyl town. After savouring this unique mystique of the Duga arrays we entered the building right behind the larger of the two installations. 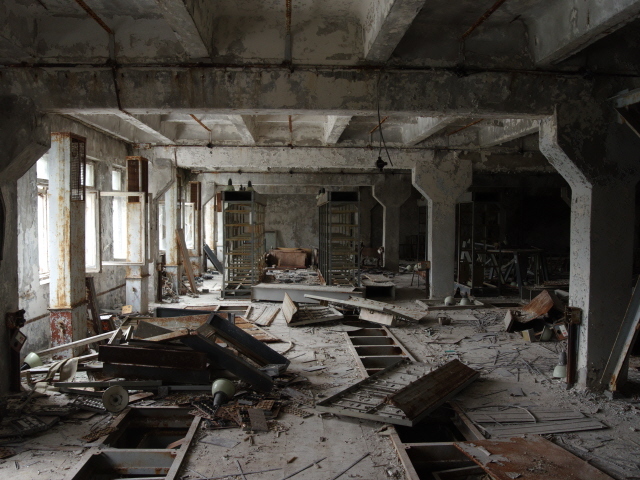 First there were long corridors strewn with debris, and rooms branching off to the side with lots of cabinets that would once have held all the amassed electronic equipment that Duga required. The first highlight in here then was entering the control room. The size alone gives you an impression of what a massive undertaking this installation must have been. It's a cavernous hall of almost Houston-Mission-Control-Center dimensions … except that most of the computer equipment has long been looted. Still, you can see some ex-computer consoles, some even still with tube monitors in them. 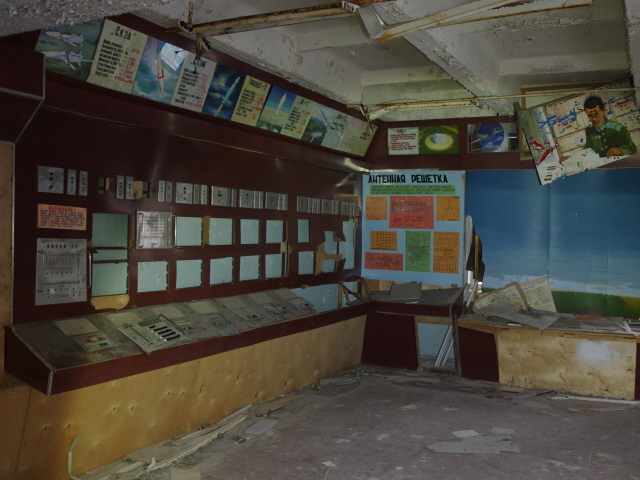 We then moved on to a room that my guide referred to as the “propaganda room” … more than that it seems to have been a “know-your-enemy” room, going by the images of NATO military hardware such as tanks, fighter planes and an AWACS system. After a short foray to the rooftop from where the Duga arrays could be seen from behind, we proceeded to what was the training centre for the staff operating the technology here. Again there were lots of looted consoles, mainframe computer cabinets and all manner of cryptic controls and panels. In another room there was yet more educational material about NATO weaponry, including all the main American cruise missiles and ICBMs, including Titan II and the still current Minuteman III. 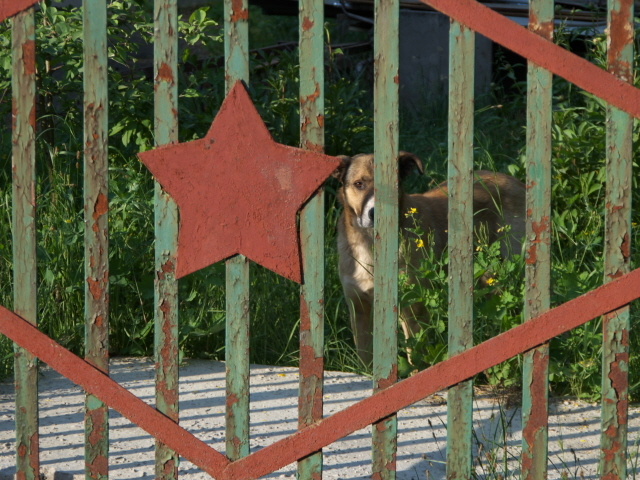 We then made our way over to the ghost town adjacent to Duga, which was back then called Chernobyl-2 (see background). 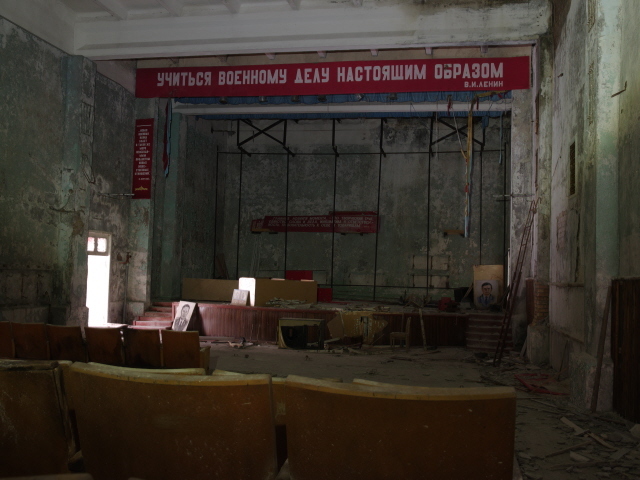 We went via the fire station – which was the only one in the area that was not called out when reactor 4 at the Chernobyl NPP had exploded and was burning. Too secret was Duga/Chernobyl-2! 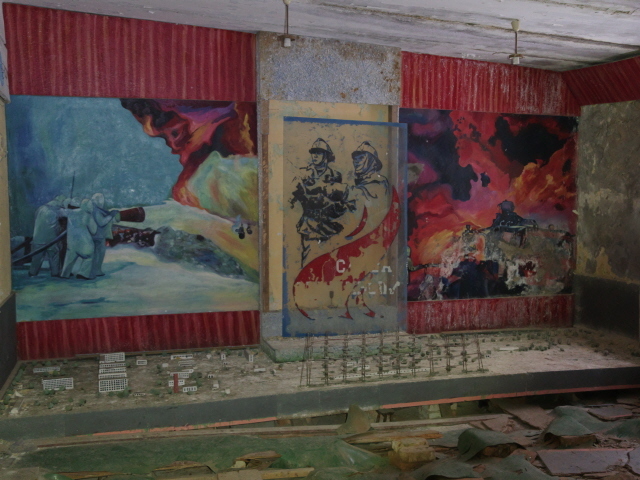 Inside the fire station, the best bit – and the reason for venturing in – was the room that had a scale model of the Duga complex as well as some flamboyant Soviet murals on the wall behind it. 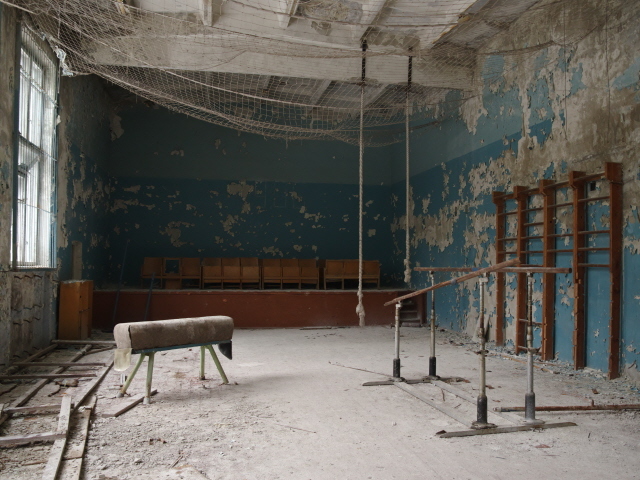 The town of Chernobyl-2 felt very much like Pripyat, only smaller … and less familiar. But here too you can find gymnasiums/sports halls and a school. In the music room I even found an upright piano whose strings could still be played by hand (the keys were all knackered), so I had a go at some “avant-garde modernism” in terms of music. There was no choice other than that – the strings were of course hopelessly out of tune after all that time, so dissonance was unavoidable anyway. Overall, I found this Duga site one of the most fascinating things within the Zone (which isn't exactly short of fascinating things!). When I was first there in 2015, I practically had to be dragged away in the end – I could have just stared at this wondrously mysterious technology and its titanic proportions for much longer. 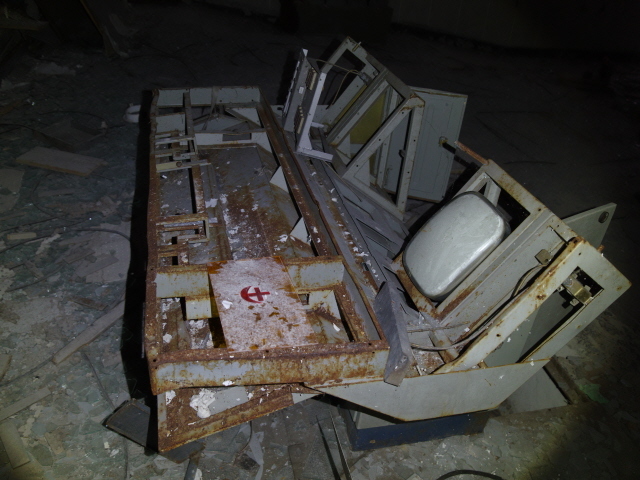 So, naturally, going back again in November 2018 – in that mystic misty weather at that – and exploring the former control room and other ancillary buildings as well as Chernobyl-2 made it all only even cooler. 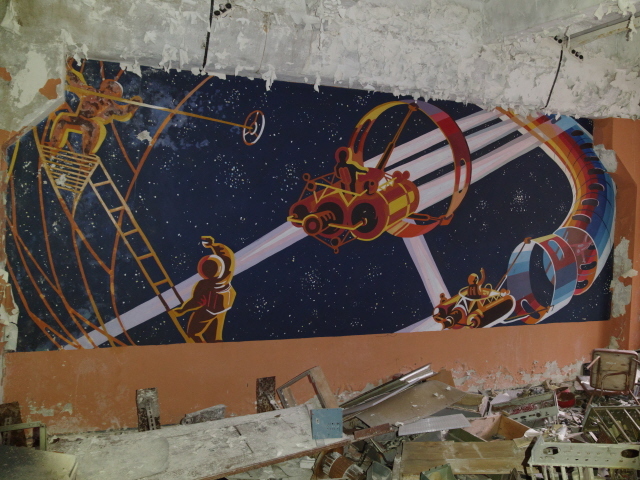 Some of the latter was even better than what you can find in Pripyat – and that's saying something! Location: in the middle of the forest of the Chernobyl Exclusion Zone, ca. 6 miles (10 km) south of the Chernobyl NPP and ca. 7 miles (11 km) west of Chernobyl town, as the crow (or stork) flies and ca. 10 miles (15 km) by road. 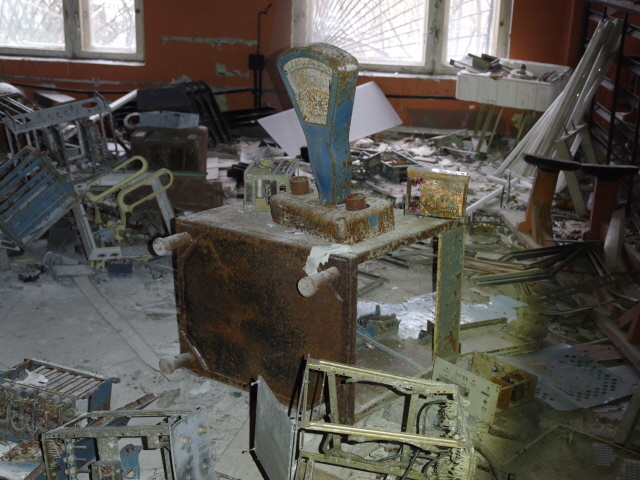 Access and costs: only as part of a guided tour in the Chernobyl Exclusion Zone. 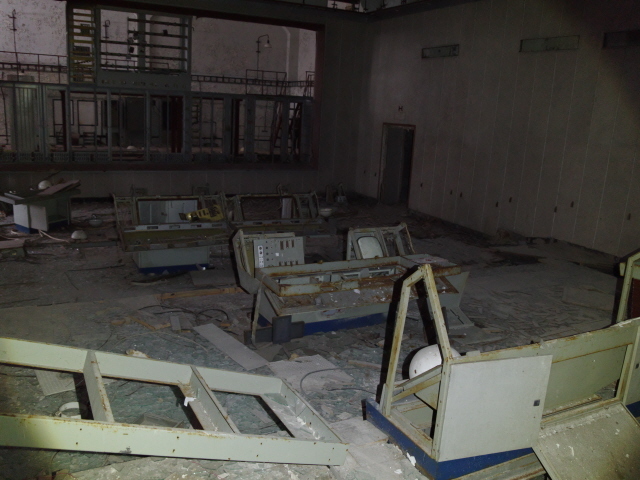 Details: Until not that long ago, the Duga installation remained a little insiders' secret and only a few tours to the Chernobyl Exclusion Zone ever went there. This has now changed. Today the detour for at least a short stop at Duga is quite common, even many shorter tours allegedly slot this in (according to the one “Duga-3” disputing operator, ALL tours now go there). The drive from Chernobyl town is about 10 miles (15 km), first by normal road, then by typical military patrol track (made of concrete slabs), so quite doable for any vehicle, if a bit slow because the track is so rutted. 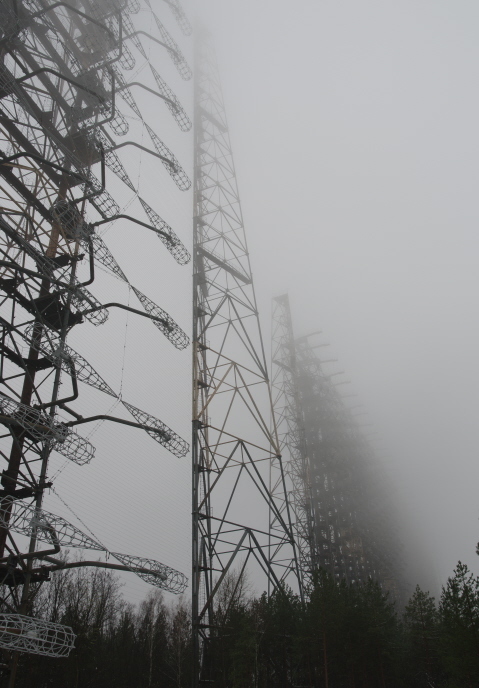 Duga is most definitely a regular part of any of the longer tour programmes – see under Chernobyl in general. In all such package tours the Duga visit will be included in the overall price. 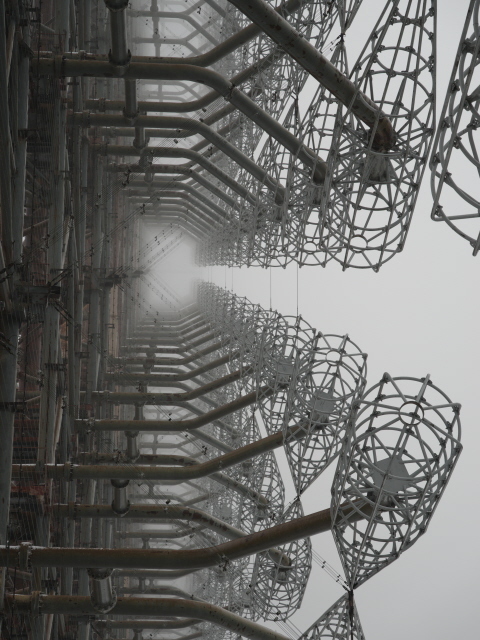 Some tour operators, however, also offer stand-alone tours to just the Duga installation, with more time given at the main site of the large antenna arrays, and also deeper explorations of the various ancillary buildings and operating facilities (ca. 6 hours in total). Such tours cost around 150 to 180 EUR per person, depending on the group size and whether or not they are done as an add-on to a two-day Chernobyl tour booked with the same company. I've read on at least one operators' website that Duga is still a “sensitive site” and that permission to go there cannot be guaranteed. This seems to conflict with statements that these visits are now a regular thing. When I was there, as part of a private two-day Chernobyl Zone tour we encountered no problems at all, and none were reported by my guide. So I assume that note is merely a back-covering remark to be on the safe side. 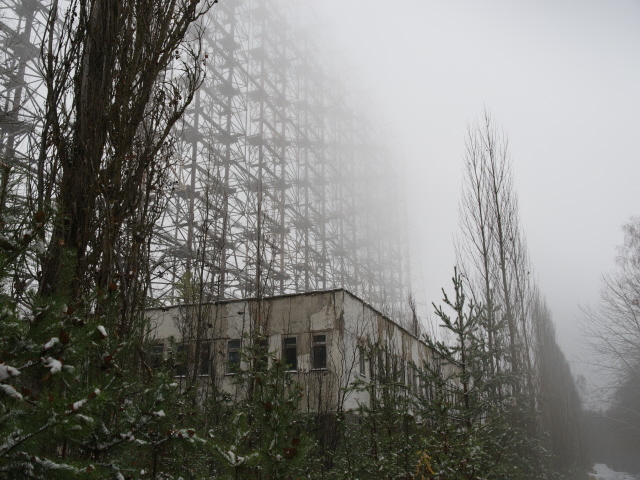 Time required: between half an hour for just a cursory look to several hours, if you also want to attempt to climb up and enjoy the views from the top or get the chance to explore the buildings of the control room and Chernobyl-2 as well. 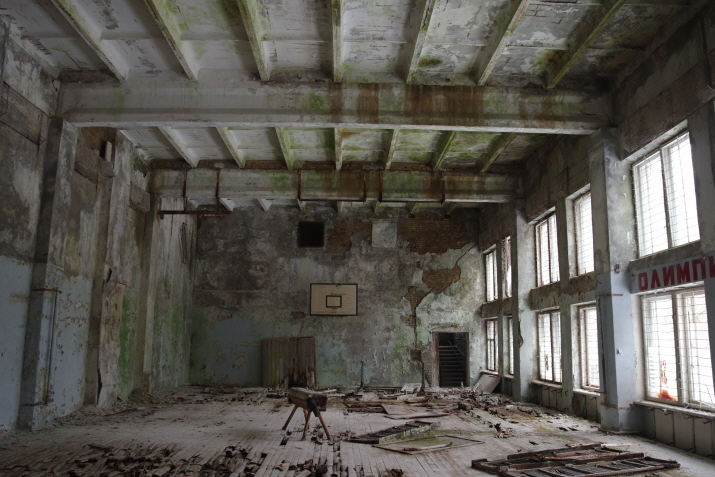 Combinations with other dark destinations: see under Chernobyl. Combinations with non-dark destinations: Wildlife is said to be spotted regularly along the route to the Duga installation ... though when I went in May 2015 none could be seen (it was a hot day, so any animals around were probably still hiding in the shade in the dense forest). Nor did I spot any on my return trip to the Zone in November 2018 – although my guide said he'd seen wolves for the first time just a week earlier on the approach track to the Duga site! See also under Chernobyl and Ukraine in general.